The Bond of love between a brother and a sister is one of the most beautiful and chaste relationship . Raksha Bandhan or rakhi is a festival to celebrate this bond. The festival is celebrated with the tying of the Rakhi thread around a brothers wrist.This thread, which pulsates with sisterly love and sublime sentiments, is rightly called the ‘Rakhi’. It means 'a bond of protection. The day involves a lot of gift exchange and merry making. Today brothers and sisters all over the world can send rakhi and rakhi special gifts to India with the help of online gift stores and websites. Raksha Bandhan is an Indian festival which celebrates the love and sacred relation between siblings. This auspicious occasion is celebrated by tying a Rakhi thread on a brother';s wrist to protect him from all kinds of evil influences. You can cherish your loving brother by sending him online Rakhi along with other amazing gift items on this special day of Raksha Bandhan. This chapter includes articles that discuss about the celebration of Raksha Bandhan by sending online Rakhi to India. Raksha Bandhan which is also termed as Rakhi Purnima is celebrated on a full moon day in the month of Shravan according to the Hindu calendar. Raksha Bandhan means the bond of protection and is the eternal tie of love for the siblings. According to popular culture, the origination of Raksha Bandhan can be associated with a number of myths and facts. This chapter includes articles that discuss about the history and mythologies associated with Raksha Bandhan. Raksha Bandhan is a popular Indian festival and is celebrated in all over the world with great gusto. It strengthens the eternal bond of love shared between brothers and sisters. Raksha Bandhan is celebrated by tying a Rakhi thread on a brother';s wrist. It implies protection of a brother from evil influences and sisters seek eternal protection by tying a thread around a brother';s wrist. This chapter includes articles that discuss about the significance and various aspects of an auspicious occasion like Raksha Bandhan. The auspicious festival of Rakhi is celebrated on the purnima of the Hindu lunisolar month of Shravan. Raksha Bandhan honours the close relationship that is shared between a brother and a sister. The rituals of Rakhi Purnima include the sister performing an arti of the brother, applying a tika on his forehead and tying the holy Raksha Bandhan thread on his wrist. After the grand success of Rakhi 2018, everyone is waiting very eagerly for the coming year’s Raksha Bandhan. There are various stories and myths behind the celebration of Rakhi that make the festival what it is. Looking into such many facts and theories can surely help us to understand this wonderful festival even more. Things about Raksha Bandhan There are various stories surrounding Rakhi that give an explanation of how this grand festival began. Lord Vishnu is believed to have created a holy thread for Lord Indra that He gave to Indra’s wife Indrani before a great battle. A different version of this story states that Brihaspati created such a thread for Lord Indra after the demons conquered heaven. The great epic Mahabharata also bears evidence to a prevalent myth about Raksha Bandhan. Draupadi wrapped Krishna’s bleeding finger with a piece of cloth from her own dress and later Krishna saved her during her time of distress by providing an unlimited amount of cloth to wrap herself with. Alexander’s wife Roxana sent a Rakhi for Porus and this saved Alexander’s life as Porus could not kill him in battlefield. Rani Karnawati sent a Rakhi for Emperor Humayun and asked for his protection against the invasion of Bahadur Shah which Humayun immediately gave to her. If you are away from your siblings during this divine event then you can send attractive and unique gifts. Sending Rakhi to India has now become quite easy and affordable through this reliable online Rakhi store. A variety of Rakhi threads as well as many other interesting gifting options can be found on this online Rakhi portal. Rakhi Gift Ideas Exclusive Rakhi threads have been showcased on this Rakhi site that can be sent to India for your brothers. The Cute Cartoon Kids Rakhi is for your kid brother that features a sweet little blue dragon. The Alluring Green Stone Lumba can be sent for your dear bhabhi and it is green in colour with several embellishments. The Elegant Drop Shaped Rakhi will be loved by your brother studded with several beads and stones. There are chocolate gifts here that your siblings will love to receive on this occasion as everyone loves such treats. The Silver Tray of Delectable Chocolates consists of many varieties of branded chocolates on a silver tray. Healthy and crunchy dry fruits can also be sent as gifts as they are preferred by most due to their nutrient content. The Mixed Dry Fruits in an Octagon Tray has four kinds of dry fruits in five delicious tastes on a red and golden tray. Mithai gifts will also be enjoyed by your brothers and sisters as these sweet delights are a great favourite. The Delectables in a Heart Shaped Tray with Rakhi is filled with kaju sev and also mawa bati sweets. You can send these gifts along with many others in a very hassle free and convenient manner through us. This online Rakhi store can send Rakhi to India from USA as well as many other countries. Have a wonderful Raksha Bandhan with your brothers and sisters through these amazing gifts. Raksha Bandhan or Rakhi is an annual festival that is celebrated on the purnima of the Hindu lunisolar month of Shravan. This is a celebration of sibling love and as such it has attained a highly secular stature among all Indians. However, the occasion still continues to be a Hindu tradition with various rituals and cultural significance. Rakhi is mainly celebrated by an exchange of gifts among the brother and the sister apart from the tying of Rakhi thread. India being a very diverse country has varied customs and traditions in its different parts or regions. This is true for the festival of Raksha Bandhan as well to the extent that the day has different names in different states and communities. We will now look into a few of such scriptural names of the festival of Rakhi that will help us to know it better. Rakhi Purnima Raksha Bandhan is known by its popular name or Rakhi Purnima in the north west region of India. Here it is all about the bond between siblings with the sister performing the various popular Rakhi customs. The sister performs an arti of the brother, applies a tika of roli and chawal on his forehead and then ties the sacred thread on his wrist. Nariyal Purnima Rakhi is called Nariyal Purnima by those living on the Western Ghats in the coastal areas of this country. The fishing community depends on the sea for livelihood and hence people pray to Lord Varuna, the God of the sea, to cast fare winds during the impending monsoon season. They offer nariyal or coconuts to the God to appease Him as this particular fruit is considered to be an auspicious one, being related to Lord Shiva. Avani Avittam Avani Avittam or Upakramam is the name that is given to this festival in the south of India, including Odisha and Maharashtra. The day is observed mainly by the Brahmins of this region who change their holy thread or Janeu. They begin the day by immersing themselves in a holy water body and asking forgiveness for the sins they have committed in the preceding year. Kajari Purnima Raksha Bandhan attains the name Kajari Purnima in the central part of this country in states like Madhya Pradesh, Chhattisgarh and Uttar Pradesh. Farmers worship Goddess Bhagwati on this occasion while praying for a good season of crops. This is also an important occasion for women having sons who pray for their longevity by worshipping crops of barley that are brought from the field. Pavitropana The festival of Pavitropana is celebrated on this day by the people living in the state of Gujarat. Lord Shiva is worshipped on this occasion and the Shiv Ling everywhere are bathed with water while the people pray for atonement of their sins. Pavitra or strands of cotton are knotted together and then dipped in Panchagavya or the five holy cow products and then tied around the Shiv Ling. Rakhi Gift Ideas This Rakhi site deals with a large number of online Rakhis for both kids and adults that can be sent to India. The Peacock Feather Stone Rakhi is a Rakhi for brother that is in the shape of a peacock with red threads. You can also get Rakhi hampers on this online Rakhi store where there are many types of delectables and other gifts. The Flavourful Hamper of Goodies with Rakhi consists of Ferrero Rocher chocolates, almonds in a pouch and branded gulab jamun as well as a Rakhi with roli and chawal. Thus, these and other Raksha Bandhan gifts can make Rakhi and all of its forms a memorable occasion anywhere in India. You can send Rakhi to India in an easy and hassle free manner through this online Rakhi portal. Knowing more about these regional forms of Rakhi celebration can help you to choose a proper gift for those living in various parts of India. Just as all festivities celebrate some sort of relationships in the Indian context, Raksha Bandhan also celebrates one such important relationship. Celebrate to understand the meaning of this festival and send rakhi to India on this auspicious day. That relationship is the one between sister and brother. The fanfare with which this relationship is celebrated in India is unparalleled. The festival celebrates the love and affection between brothers and sisters on a day when both of them pray for well being of each other and wish prayers for all good things to come. Deep rooted meaning of a beautiful relationship To understand the name of ‘Raksha Bandhan' let us understand each word separately. The word “Raksha” means “ to protect” and the word “Bandhan” means bond. Effectively it means the “protection bond”. On the day of “Raksha Bandhan” brothers vow that they will protect their sisters from all evil and from difficult times and in return sisters pray for the long life of their brothers and wish them success in all their endeavours. The festival is celebrated in the month of August on the day of Shravan Purnima and is celebrated by sisters tying a rakhi on the wrist of their brothers and applying tilak on the forehead of their brothers. Festival that glorifies the sense of protection With the word “Bandhan” within Raksha bandhan, the phrase has becomes synonymous to protection and appeals to many relationships where protection is sought for. There are many instances from history which indicates that the sacred thread (rakhi) could be tied by a mother, a wife or a daughter. The monks tied rakhis to those who came to them for blessings and in return they expected that they be protected by their followers. Surpasses the bond between sister and brothers Although earlier, Raksha Bandhan was being celebrated only between brothers and sisters, in today’s time it has gone beyond brothers and sisters. It is celebrated among relatives of extended families; some also tie rakhi to their neighbours for peaceful co-existence. The concept of Raksha Bandhan was deftly used by Rabindranath Tagore to instil a feeling of unity among all members of society to lead a peaceful social life of harmony. So, send rakhi to India from USA to members of extended family or anyone from your neighbourhood and strengthen the relationship. Values of Raksha Bandhan applicable to many walks of life These days, the significance of “Raksha Bandhan” touches upon many walks of life and its importance is much widely understood. People take vows on this occasion to lead a life full of moral and spiritual values. The sense of protection and standing up for people when they are in need and not giving up on them, which this festival inculcates can be applied to many walks of life for peaceful living and leading a harmonious life. One of the rituals practiced on this day is the sister goes to the brother’s house to tie the rakhi, almost uniting the family and strengthening the family bond. On this day, families are united and the bonding grows stronger between them. The importance of Raksha Bandhan or more commonly known as Rakhi is far-reaching and surpasses the celebration of love and affection between sisters and brothers. The values in this festival are very relevant for families and society at large, to protect each other and stand up for people in need. Thus, making the family bonds even stronger and the society a better place to live in! Rakhi or Raksha Bandhan is one of those traditional occasions in India which is treated with utmost respect and celebrated widely across the length and breadth of the nation with great gusto. The event is dedicated to brothers and sisters and celebrates the eternal bond of love between them. The term “Raksha Bandhan” has been derived from the Sanskrit word meaning, ‘to tie the knot of protection’. This means, a brother is supposed to act as the shield to his sister in times of any trouble or difficulty. It is an untold vow shared among the two. While the sisters tie the thread on the wrists of the brothers as a gesture of eternal love, respect and gratitude and wish them a long, healthy and prosperous life, the brothers at the same time pledge lifelong protection to the sisters from all oddities. When is Rakhi in 2018 ? According to traditional Hindu calendar, Raksha Bandhan is celebrated on a full moon day, in the month of Shravan. Hence, the day is also known as Rakhi Purnima. According to the Gregorian Calendar this year, Rakhi will be celebrated on 26th August, Sunday. The beauty of this festival lies in the fact that it is not only celebrated among siblings related by blood but also celebrated amongst men and women who are not related by blood. Steadfast faith and enduring love are the real essence of Raksha Bandhan. Rakhi Customs On the day of Rakhi, the sisters take a bath to purify mind and body before starting any preparations. Then they prepare the puja thali consisting of roli, tilak, Rakhi thread, rice grains, agarbattis (incense sticks), diyas. shagun nariyal and sweets. Then they perform aarti before their brothers with this thali and tie the Rakhi thread on the wrists of their brothers. This ritual is of immense importance because the thread and the knot signifies the bond shared by the siblings. Then, they put kumkum powder on the forehead of their brother and offer sweets. All the while the sisters utter various mantras wishing for long life and prosperity of their brothers. In return, the brothers pamper their sisters with various gifts and promise to protect them from all the evils of this world. India is like one single continent that houses various countries, each with its unique culture, language and way of lifestyle. That is why the rituals performed on Raksha Bandhan may vary from place to place but carry the same aura everywhere. For example, on the occasion of Rakhi, the states of Punjab, Odisha, West Bengal, Gujarat etc. usher in celebrations and festivities.People shower their love and blessings on their near and dear ones with gifts during the Rakhi ceremony. Such is the enigma and charm of Raksha Bandhan that even if siblings are unable to be physically present on the particular day, in the age of globalization they make it a point to send their best wishes via online Rakhi India delivery services. Through their prompt and trustworthy services, these websites will make sure that apart from sending Raki to India you can also convey your love traversing long distances from countries like UK, USA and Australia. Rakhi in Hindu Mythology Since times immemorial India has witnessed the wonderful affection shared between siblings. Indians hold Raksha Bandhan in high esteem. Stemming from a host of ancient beliefs, Hindus, Sikhs and Jains continue to follow this tradition with undying faith. According to Hindu mythology, it was Draupadi who tore a piece of cloth to tie on the wound of Krishna when he was bleeding, after having beheaded Shishupal. Krishna kept his vow of protecting Draupadi during the infamous ‘vastraharan’ episode of Mahabharata. Another mythological instance of Raksha Bandhan was between Bali (the demon king and ardent follower of Lord Vishnu) and Goddess Lakshmi (wife of Lord Vishnu). It is said that Lakshmi tied Rakhi to Bali’s wrists and asked that she and her husband be allowed to return to Vaikuntha (abode of Lord Vishnu and Goddess Lakshmi). Rakhi in History The historical references say that just before Alexander the Great and King Porus’s battle, Roxanne (Alexander’s wife) had sent a rakhi to Porus asking the king not to harm her husband. Porus did respect her request. Another incident tells that Rani Karnavati of Chittor sent a rakhi to Humayun asking for protection from the invasion of Bahadur Shah. 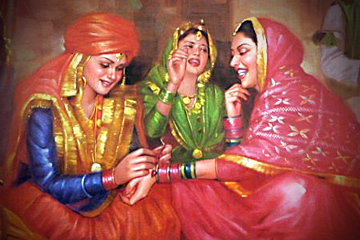 However, according to some of the historical accounts, Rajput queens were known to practice the custom of sending rakhis to neighbouring rulers to foster fraternal ties and ensure peace among the kingdoms. This request was honored by Humayun. Many years down the line, Nobel laureate Rabindranath Tagore started the tradition of Raksha Bandhan between Hindus and Muslims on the occasion of Bengal Partition, to evoke communal harmony between Hindus and Muslims during British rule, to dissuade riots. It was meant to symbolize unity and mutual respect for each other’s religion. Raksha Bandhan Across India India has always boasted of the saying “Unity in Diversity”. In a multi-cultural land like India, the festival of Raksha Bandhan assumes different names and exudes colourful vibes. In Mathura and Vrindavan of Uttar Pradesh, Mayapur of West Bengal and in Odisha, Rakhi Purnima coincides with the last day of Jhulan Yatra. In these places, the occasion is also known as Jhulan Yatra. In Kumaon, it is celebrated with Janopunyu, when men change their sacred threads. In the northern part of India, this festival is also well known as Kajri Navami or Kajri Purnima and is celebrated by worshipping Goddess Bhagwati. The festival is even termed as Nariyal Purnima in Maharashtra, where coconuts are offered by fishermen community to Varuna, the sea-god. 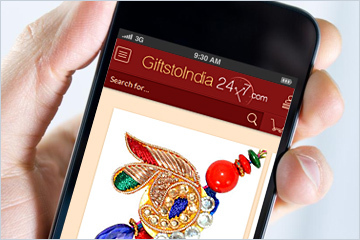 With the advent of online gifting portals like Rakhi.GiftstoIndia24x7.com, the trend of selecting online Rakhi India and sending them to your loved ones is fast catching up. Send Rakhi to India for your loved ones and make the occasion of Rakhi a memorable one. With Rakhi just few months to go, the online gifting site, Rakhi.Giftstoindia24x7.com has brought to you a wonderful collection of Rakhi threads and gifts for you to send Rakhi to India. Hence due to some professional or education commitments and consignments, if you are unable to come home this Rakhi, you can definitely take the assistance of this online gifting site to send Rakhi threads and gifts to your dear brother. In the Rakhi threads section, you will find a great collection of impressive threads ranging from Zardosi to Bhaiya-Bhabhi Rakhi. In the Bhaiya Bhabhi Rakhi section, Rakhi threads for bhaiya and lumbas for bhabhi are arranged. These Rakhi threads are decorated with sequins, colorful threads, zaris, faux stones, beads and so on. Moreover in the kids Rakhi section, a wide galore of threads with popular cartoon characters such as Mickey, Goofy, Harry Potter, Piglet, Doraemon and a lot more are arranged. These Rakhi threads if sent on this auspicious occasion will definitely bring a charming smile on your dear brother’s face. Apart from threads, you can also send Rakhi gifts to India through this proficient portal and add a special charm to the event. 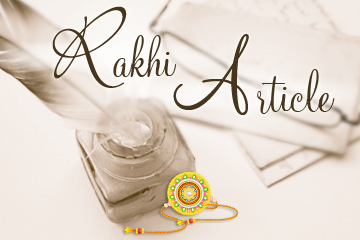 You will definitely be overwhelmed to check the articles arranged in the Rakhi gifts section. here the site has arranged gift for all. Hence you can sure to find and send Rakhi to India to your dear brother. Since this portal has been serving the NRIs and you must be thinking that sending Rakhis to India would dig a hole into your pocket. Then please make a note that you can send online Rakhi to india cheap through this portal. Home Decor would be a great option to send as gifts. In this Rakhi Gifts section you will find a wonderful collection of flower vases in different shapes. Golden colored ethnic flower vases would make a wonderful gift and would also add to ones home decor. Besides these, you will also find vases in other shapes in black and red colored combo that will attract one’s attention. Polyresin peacock flower vase is a kind of its own. This unique flower vase would definitely be loved by your brother. Send these vases on Rakhi to India 2018 and heighten the charm of the festival. You can also send Rakhis to India paired with beautiful showpieces. Browse through the section to find out wonderful collection of home decors ranging from beautiful candle stand to crystal parrots, dancing couple to flower vase and tribal love couple to table clock. Your brother will welcome these showpieces as gifts. These would be the perfect choice if he love to decorate his home or he has just shifter to his new residence. Send Rakhi to India and bring back happiness. Wall Hangings also can be a great gifting idea if coupled with your online Rakhi to india. Here again you will get to see a broad range of wall hangings. Some of the hangings are the images of the almighty such as Shiv Durga, Gopala, Radha and Sri Krishna, etc. Alongside these, wooden wall hanging with the images of flower and landscape would also delight your dear brother. Gunmetal made Ganesha, Hanuman, Sri Krishna and Tirupati figurines are also available in this section. Send online Rakhi to your dear brother in India and make the special festival even more precious. He will definitely be delighted to receive these gifts and feel pampered. These gifts will convey your love and emotions despite being far away from your brother.